To find one of the world’s rarest felines, first fly into Tokyo. You’re still a long bus ride, two more flights and a turbulent ferry jaunt from reaching the only spot in the world—a far-flung island in southern Japan’s Yaeyama group—where an observer can spot a wild yamaneko, or mountain cat. You probably still won’t see one of the 100 or so surviving cats that roam the humid jungles of Iriomote Island. But you"ll have company, since growing numbers of other wildlife enthusiasts are trying. After living for millions of years, the greatest threat these ancient creatures face might be the hordes of modern visitors who wish to see them. The elusive mountain cat is comparable in size to an American bobcat, possesses slightly larger ears, and is generally considered an isolated relative of Southeast Asia’s leopard cat. For years, the dense forests of far-flung Iriomote helped the shy creature hide—it wasn’t discovered by humans until the 1960s. But remote is a relative term. Billed to tourists as the last wilderness in Japan, Iriomote has become a popular sightseeing destination. In the past two years alone, the number of annual visitors has nearly doubled, from 360,000 to 700,000. A new 141-room luxury resort built in 2004—the first of its kind on Iriomote—has made the island more accessible to people who might not otherwise make the 1,200-mile trip from Tokyo. This raises fears of resource pressure and habitat degradation impacting a dwindling cat population. Besides the attraction of the mountain cat, tourists come to hike in the jungles, rest on pristine beaches blanketed with white sand and snorkel in the crystal blue sea. Ecology-minded travelers visit the island to seek the mountain cat, watch sea turtles, spot birds like the Ryukyu serpent eagle or just enjoy that rare place in Japan where trees far outnumber people. Ninety percent of 70,000-acre Iriomote is undeveloped, and the permanent population barely crests 2,000. Elsewhere in Japan, population density stands at 865 people per square mile. Here, the figure is just 19. Iriomote’s wild nature is indeed spectacular. Lowland habitat in the Urauchi River basin is prime terrain for the mountain cat, a skillful swimmer. Yamaneko catches fish, small crabs and amphibians in and around the water. Of the 76 species Japan’s environmental ministry lists as threatened with extinction, 14 live in the Urauchi watershed, making it the most biologically diverse river system in Japan. Additional threats to the cat include inter-breeding with house cats, disease, wild dog predation and road traffic. 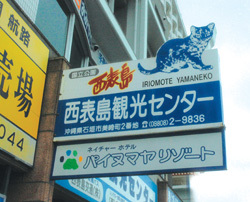 But with burgeoning tourism, being loved to death may constitute the yamaneko’s greatest peril.